In many laser printers such as HP laser printers, both the toner cartridge and the drum is housed within a single unit, and therefore there is no drum unit to replace. On the other hand, there are printers such as Brother laser printers, where the toner cartridge and the drum unit are separate parts. With these printers you will not need to replace the drum every time you change your toner cartridge. However, your drum will eventually need replacing as deterioration in the image quality can be observed, even after changing your toner. 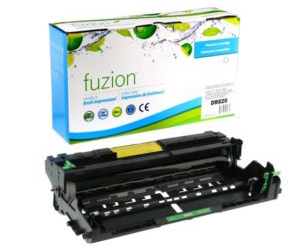 Most drum units are good for about 3 toner replacements, however, it can vary depending on how many pages per toner cartridge is being printed and the toner coverage, or the type of printing that you are doing. Some laser drum units contain all four colours (Cyan, Magenta, Yellow, Black), these are referred to imaging units. Typically an entire imaging unit needs to be replaced if your printer is a colour laser printer. Some printers will alert you when the drum unit needs to be replaced. Click HERE to view all our available Drum Units. Please CONTACT US if you are looking for a specialized drum or imaging unit.